The Ministry of Agriculture’s third advance estimates for the production of horticultural crops in India during 2016-17 has record figures for vegetables and fruit, 176.17 million tons and 93.7 million tons respectively. The horticultural division counts 22 vegetable classes and a 23rd which includes all others. Likewise 26 classes of fruit and a 27th which includes all other fruit. Unfortunately, the horticultural division does not name these ‘other’ vegetables – which I surmise will include a number of leafy greens, tubers and beans – and which are estimated by the division to have amounted for the year to 23.62 million tons (mt). 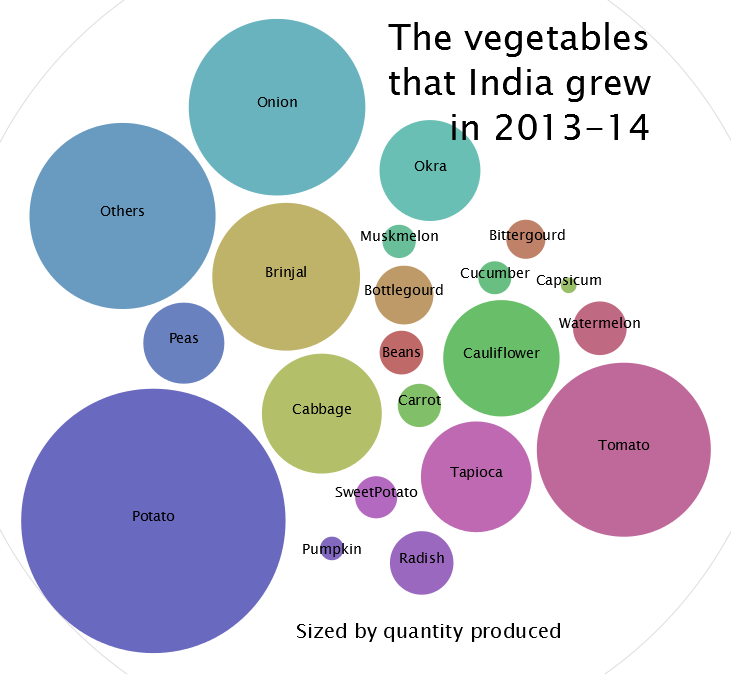 In this chart for vegetables the ‘other’ unnamed vegetables are clubbed together with those vegetables whose harvests are individually sizeable (0.2 to 0.7 mt) but under 1 mt: elephant foot yam, mushroom, capsicum and parwal. What stands out in this record harvest of vegetables is how the total tonnage is distributed. Potato, tomato, onion and brinjal together account for 101.82 mt which is 57% of the total vegetables tonnage. This is an extraordinary concentration. Worse, potato alone is 48.24 mt which is just over 23% of the vegetables total. This is a hopelessly skewed distribution by weight which I think describes how very far the writ of the snack food manufacturers runs, by governing crop cultivation choices made in the field. Most snacks available today are industrially produced mixtures of vegetable ingredients, with flavours, colourings and food scents chemically added. So-called contract farming in India began with PepsiCo’s foods division directing the cultivation of potato for its chips. 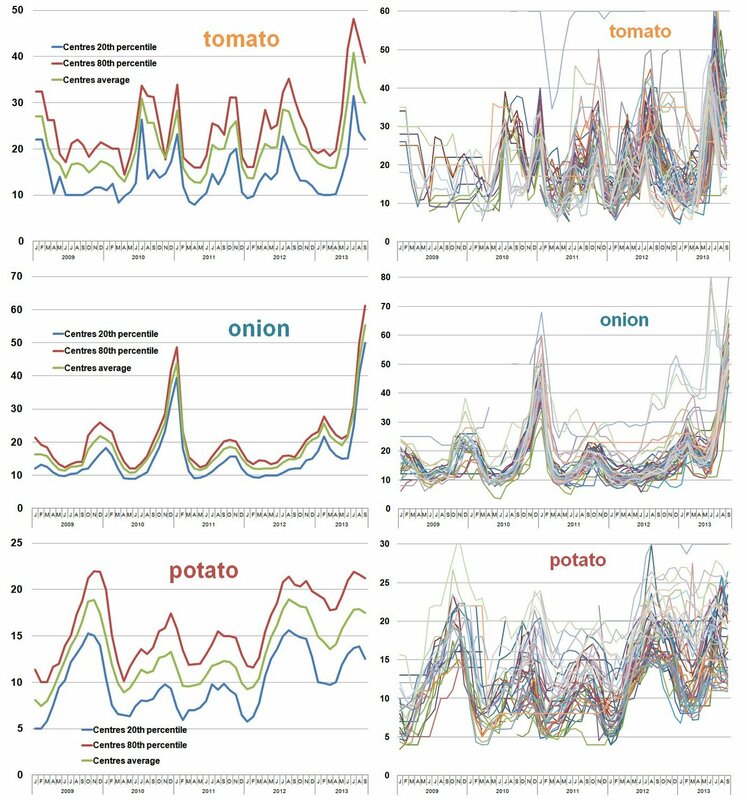 Onions and tomato followed – for the last five years some 2 to 2.5 mt of onions are exported, and tomato makes its way into numerous ketchups and sauces. Both are ‘popular’ snack flavours by themselves. Hence the top three vegetable classes account for nearly 90 million tons together. Compare this quantity with India’s wheat harvest for 2016-17 of 98.38 mt! To put the total annual quantities of onions (21.72 mt) and tomatoes (19.54) in perspective, 22.95 mt of pulses were grown during 2016-17 and this being not enough to provide our households, a further 6.6 mt was imported during 2016-17 (at a cost of Rs 28,523 crore). This is what irrational crop cultivation choices results in: kisans’ plots are dedicated to the cultivation of a few vegetable staples that serve as raw material for a snack foods industry whose products are nutritionally harmful, whereas those plots could grow pulses and save the country money, besides contributing to balanced diets. Yet the count of vegetables by the horticulture division of the Ministry of Agriculture does not enumerate even the better-known vegetables that arrive at the mandis, and whose mandi prices are listed by the same ministry. Their market names are: Alsandikai, Amaranthus, Ashgourd, Balekai, Banana Green, Beetroot, Chapparad Avare, Cluster beans, Colacasia, Coriander, Cowpea, Drumstick, Field Pea, French Beans, Galgal, Ginger, Gram Raw/Chholia, Green Avare, Groundnut pods, Guar, Indian Beans/Seam, Kartali/Kantola, Knool Khol, Little gourd/Kundru, Long Melon/Kakri, Lotus Sticks, Mango Raw, Methi, Mint/Pudina, Ridgeguard/Tori, Round gourd, Season Leaves, Seemebadnekai, Snakegourd, Spinach, Sponge gourd, Squash/Kaddoo, Surat Beans/Papadi, Suvarna Gadde, Thondekai, Tinda, Turnip, and White Pumpkin. These 43 classes (there are likely more based on seasons and agro-ecological regions) of commonly consumed vegetables, grown all over India, amount to about 22 mt, using the numbers from the third advance estimates for 2016-17. But it is upon the diversity of these lesser, ‘other’ classes of vegetables that the dietary balance of millions of households depends. Yes, the annual vegetables balance sheet for 2016-17 boasts an impressive bottom-line, but the numbers therein don’t add up. 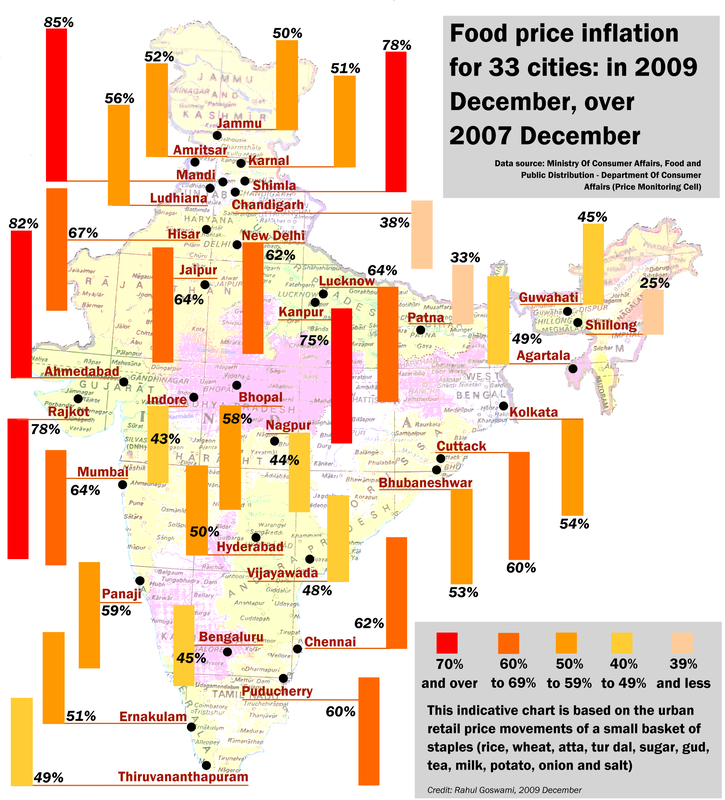 Where are Bharat’s local leafy greens in this chart? Here is the list of the principal vegetables grown, according to the third advance estimates for 2013-14 (the agricultural year is July to June) for horticultural crops. The figures are from the usual source, the Department of Agriculture and Cooperation, Ministry of Agriculture. The quantities are in million tons. Where’s the vegetable diversity? Where are the leafy greens? Are they included in that bland circle called ‘others’? The DAC won’t/can’t tell us. The numbers are: Beans 1.213; Bitter gourd 0.971; Bottle gourd 2.192; Brinjal 13.842; Cabbage 9.109; Capsicum 0.156; Carrot 1.19; Cauliflower 8.585; Cucumber 0.69; Muskmelon 0.702; Okra/Ladyfinger 6.461; Onion 19.769; Peas 4.165; Potato 44.306; Radish 2.561; Sitaphal/Pumpkin 0.356; Sweet Potato 1.126; Tapioca 7.778; Tomato 19.193; Watermelon 1.827; Others 21.953. 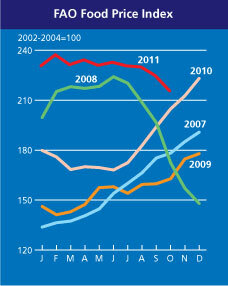 FAO 2011 October Food Index down, food prices still up, what’s going on? 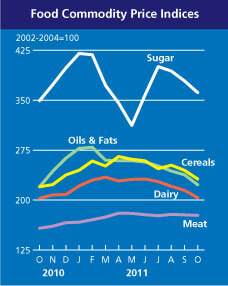 FAO has released its Food Price Index for October 2011, saying the index has dropped dropped to an 11-month low, declining 4 percent, or nine points, to 216 points from September. Indeed the index has dropped, declined and has certainly not risen. But does this mean food prices for the poor in many countries, for labour, for informal workers, for cultivators too – has the cost of food dropped for any of them? The answer is a flat and unequivocal ‘No’. FAO has said so too: “Nonetheless prices still remain generally higher than last year and very volatile.” At the same time, the Rome-based food agency has said that the “drop was triggered by sharp declines in international prices of cereals, oils, sugar and dairy products”. The FAO has said that an “improved supply outlook for a number of commodities and uncertainty about global economic prospects is putting downward pressure on international prices, although to some extent this has been offset by strong underlying demand in emerging countries where economic growth remains robust”. Once again, the FAO is speaking in two or more voices. It should stop doing so. A very small drop in its food price index does not – repeat, does not – indicate that prices for food staples in the world’s towns and cities has dropped and people can afford to buy and cook a square meal a day for themselves and their children. Not so at all. I am going to contrast what FAO has said about its October food price index with very recent reportage about food and food price conditions in various parts of the world. Business Week reported that rising food prices in Djibouti have left 88 percent of the nation’s rural population dependent on food aid, the Famine Early Warning Systems Network said. A ban on charcoal and firewood production, which provides about half of the income of poor people in the country’s southeast region, may further increase hunger, the Washington- based agency, known as Fewsnet, said in an e-mailed statement today. Average monthly food costs for a poor urban family are about 33,907 Djibouti francs ($191), about 12,550 francs more than the average household income, Fewsnet said. Urban residents in the Horn of Africa nation don’t receive food aid, it said. A Reuters AlertNet report quoted Brendan Cox, Save the Children’s policy and advocacy director, having said that rising food prices are making it impossible for some families to put a decent meal on the table, and that the G20 meeting [currently under way in Cannes, France] must use this summit to agree an action plan to address the food crisis. Malnutrition contributes to nearly a third of child deaths. One in three children in the developing world are stunted, leaving them weak and less likely to do well at school or find a job. Prices of staples like rice and wheat have increased by a quarter globally and maize by three quarters, Save the Children says. Some countries have been particularly hard hit. In Bangladesh the price of wheat increased by 45 percent in the second half of 2010. In new research, Save the Children analysed the relationship between rising food prices and child deaths. It concluded that a rise in cereal prices – up 40 percent between 2009 and 2011 – could put 400,000 children’s lives at risk. IRIN News reported that food production is expected to be lower than usual in parts of western Niger, Chad’s Sahelian zone, southern Mauritania, western Mali, eastern Burkina Faso, northern Senegal and Nigeria, according to a report by the World Food Programme (WFP) and the Food and Agriculture Organization (FAO), and a separate assessment by USAID’s food security monitor Fews Net. “We are worried because these irregular rainfalls have occurred in very vulnerable areas where people’s resilience is already very weakened,” said livelihoods specialist at WFP Jean-Martin Bauer. Many Sahelian households live in a state of chronic food insecurity, he said. “They are the ones with no access to land, lost livestock, without able-bodied men who can find work in cities – they are particularly affected by a decrease in production.” A government-NGO April 2011 study in 14 agro-pastoral departments of Niger noted that pastoralists with small herds lost on average 90 percent of their livestock in the 2009-2010 drought, while those with large herds lost one quarter. Those who had lost the bulk of their assets have already reduced the quality and quantity of food they are consuming. The Business Line reported that in India, food inflation inched up to 11.43 per cent in mid-October, sharply higher than the previous week’s annual rise of 10.6 per cent, mainly on account of the statistical base effect of the previous year. Inflation in the case of non-food items and the fuels group, however, eased during the latest reported week. According to data released by the Government on Thursday, an increase in the year-on-year price levels of vegetables and pulses contributed to the surge in the annual WPI-based food inflation for the week ended October 15, apart from the base effect. Sequentially food inflation was up 0.25 per cent. Al Ahram reported that Egyptian household budgets had mixed news in September with prices for some basic foods tumbling month-on-month and others showing small climbs, according to state statistics agency CAPMAS. Figures released this week show the price of local unpacked rice fell 15.6 per cent to LE4.96 per kilo between August and September 2011. It was the commodity’s first decline in nearly a year, although the per kilo price remains 68 per cent higher than the LE2.95 that rice cost in October 2010. Chicken also fell 5.8 per cent to LE16.26 per kilo between August and September. Other staples, however, continued to rise; the price of potatoes climbed 14 per cent to LE4.89 per kilo, while a kilo of tomatoes gained a monthly 14.8 per cent to cost LE4.65.